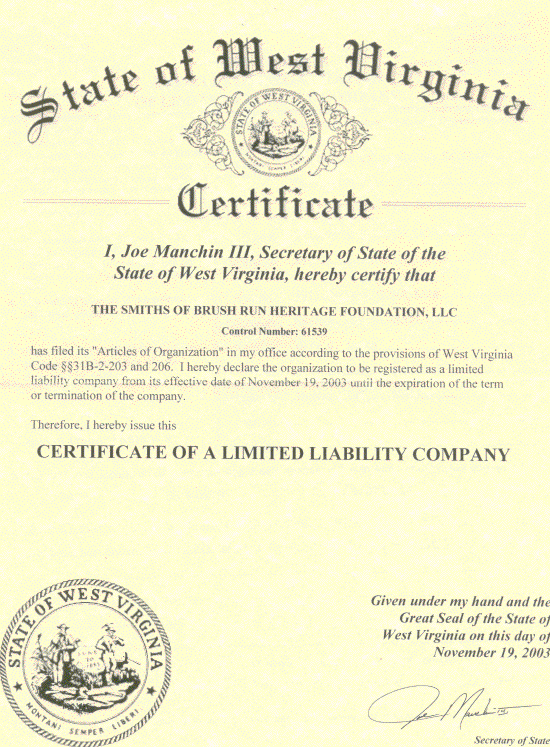 This foundation is dedicated to promoting the heritage of all descendents and relatives who can trace their ancestry or relationship to Michael and Rosena (Schmidt) Smith, German emigrants, who established their homestead on Brush Run, Braxton County, West Virginia in 1847. 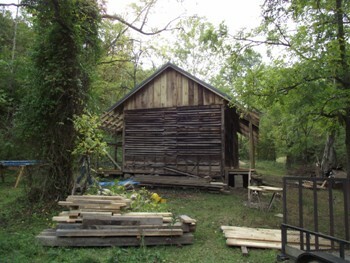 A major goal of this organization, to acquire ownership of the Log Cabin built by Michael Smith and later expanded by his son, Jacob Smith has been accomplished. 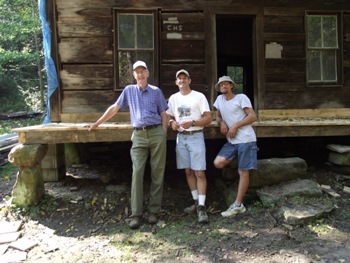 The sons of Gene Smith, Adam and Michael granted to the foundation a deed for the home and approximately one acre of land surrounding the cain. In this home two generations of Smiths were raised. On October, 1847, Michael bought 91 acres of land from a New York land company for $45.50. This land is located on Brush Run, a tributary of Cedar Creek (West) Virginia in Western Braxton County. 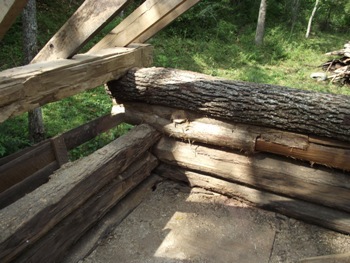 Shortly afterwards, Michael and family, probably with help from friends, constructed a Log Cabin in which he and family lived the remainder of his life. 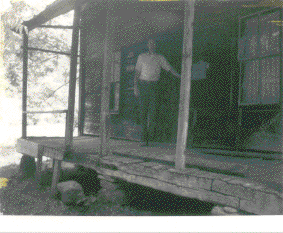 This picture is of Michael's Log Cabin taken in 1985. 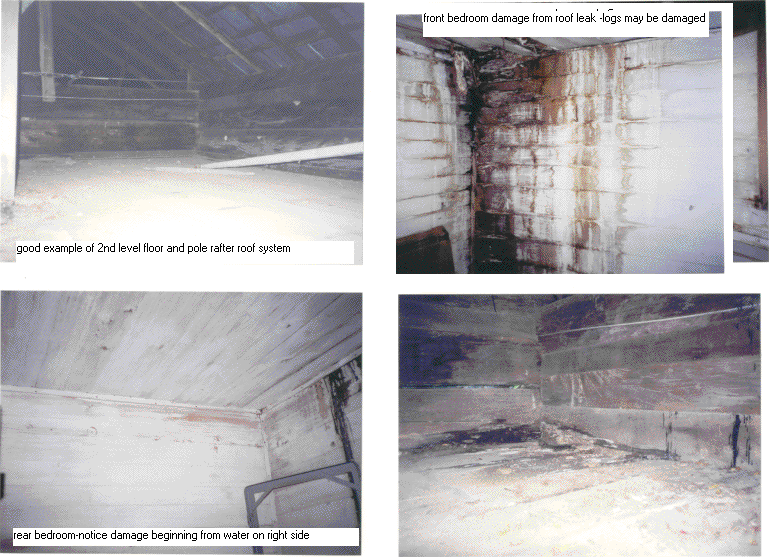 The cabin has deteriorated a great deal since. 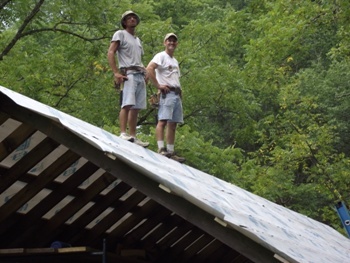 The immediate goal is to raise funds to preserve and protect it until it can be renovated. 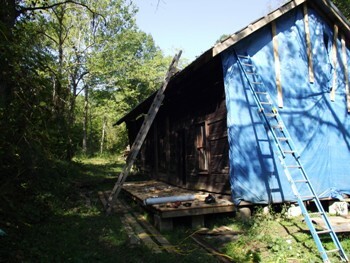 The larger goal is to fully renovate this cabin to its original condition. Basic renovation has been started and more will be accomplished in the future as funds permit. To contact me Click on the following link. 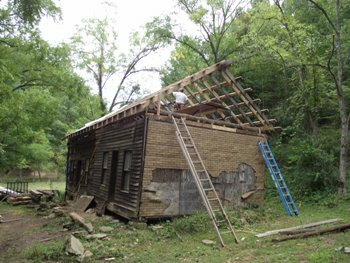 The Smiths of Brush Run Heritage Foundation is in position at this time to receive contributions to fund the repairs and renovations needed. Funds may be sent to Gary Smith, President, at 5031 Hackers Creek Rd. Weston WV, 26452. List on the check or money order " for the Smith Cabin." 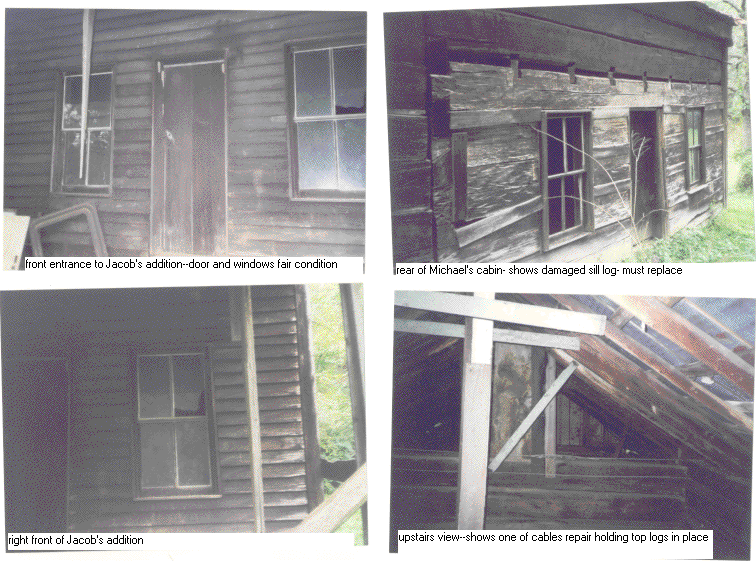 On 9/6/03 Wilma and I visited Michael's cabin, took photographs, and made a preliminary evaluation of its condition as follows. 1. 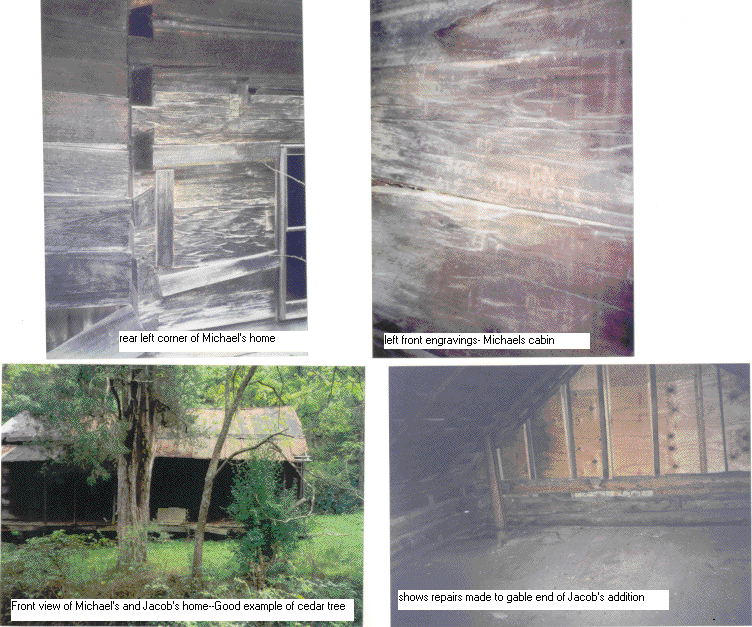 The left rear and side of the cabin yard as you view the cabin from the front, is a swampy area probably caused by the spring located in the rear and used by Michael and Jacob. It needs a drainage ditch. 2. 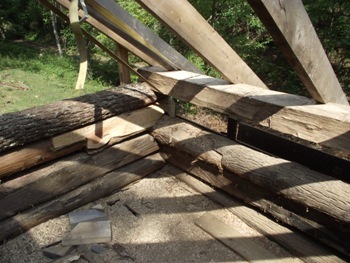 On the rear of Michael's section, the bottom log (sill log) has deteriorated and will need replaced. Some damage has started to the 2nd log. This has caused much damage to the floor joists and floor in the right rear section of the cabin. The basic problem is pier failure and ground hog damage. 3. 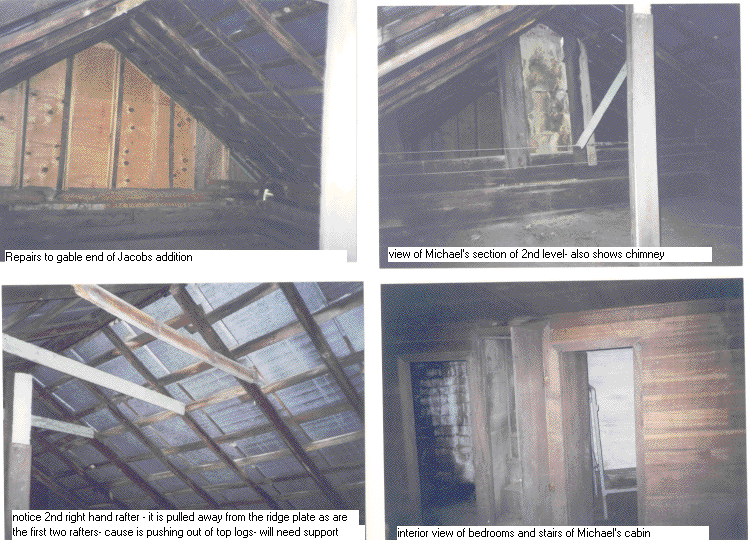 On the left gable end of Michael's cabin, the rafters have pulled away from the ridge board and separated the tin at this point allowing water to enter and run down to the corner causing considerable damage to the first and second floors in the front bedroom area. Needs a temporary roof fix. 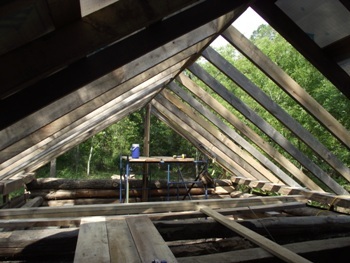 The good news is that the cabin is still structurally sound and can be repaired where it is or it can be moved and repaired and rebuilt on another location. “The Smiths of Brush Run Heritage Foundation” shall be a non- profit organization and will be so registered with proper authorities. 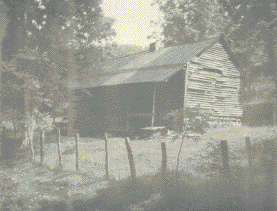 Promote and extend the heritage of all descendents and relatives who can trace their ancestry or relationship to Michael and Rosena (Schmidt) Smith who established their homestead on Brush Run, Braxton County, West Virginia. 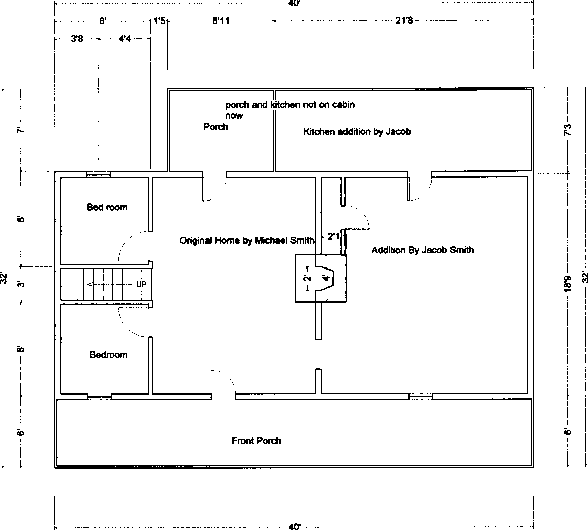 Acquire ownership of the log cabin built by Michael Smith and expanded by his son, Jacob Smith, presently situated on its original location on a part of the original tract of land purchased by Michael Smith. 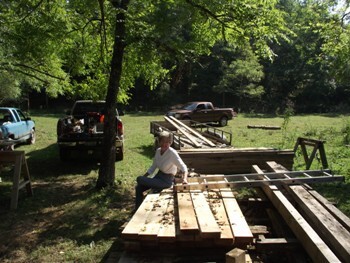 Establish, acquire, arrange, lease, or purchase land for a location for the cabin's remaining years. 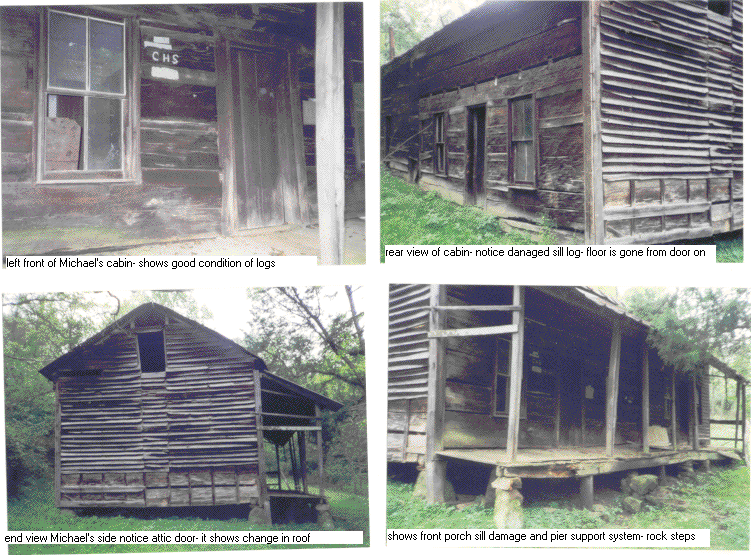 Preserve, repair, renovate and maintain the log cabin as near as possible to its original condition. 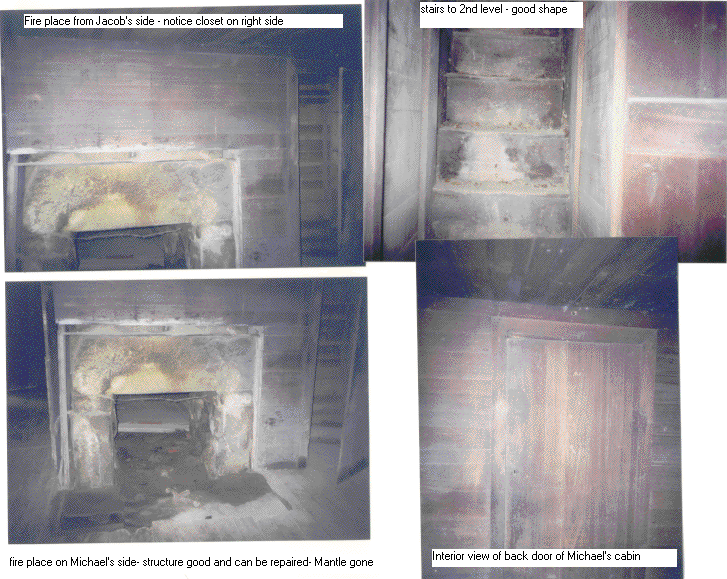 Secure or construct furniture that would have been used during the period of time that Michael and Rosena would have used the Cabin. Solicit, receive, and disperse funds to fulfill the purposes of this foundation and to conduct the business affairs of the foundation. Perform any other business or purposes set by the officers and the membership. 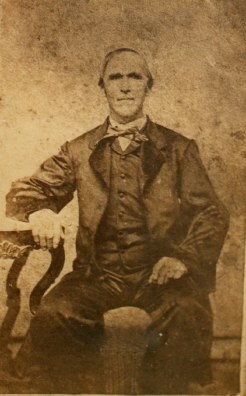 Membership in “The Smiths of Brush Run Heritage Foundation” shall extend to all descendents and relatives of the Michael Smith Family and shall also be available to those interested in fulfilling the purposes of the foundation. Membership fees, if any, will be set by the officers and the general membership of the organization. 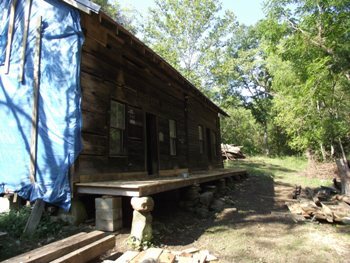 The Cabin shall be made accessible and available to all family members to visit and review so that they may have the opportunity to learn about their ancestors and their way of life. Be it hereby known to all persons that the preceding Articles of Organization shall be effective on this day the 15th of August 2003.